Welcome to the fifth year of Agency Spotter’s Marketing Trends Report. The marketing services landscape continues to grow in size and complexity. And, we continue our mission to bring more transparency to the marketing services industry. 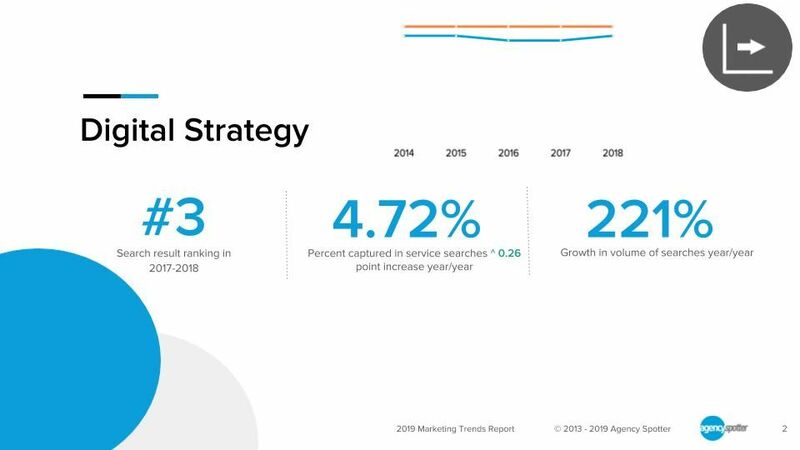 The report covers a lot of ground, including a breakdown the top 41 services and the 5 marketing trends we see shaping the year ahead. 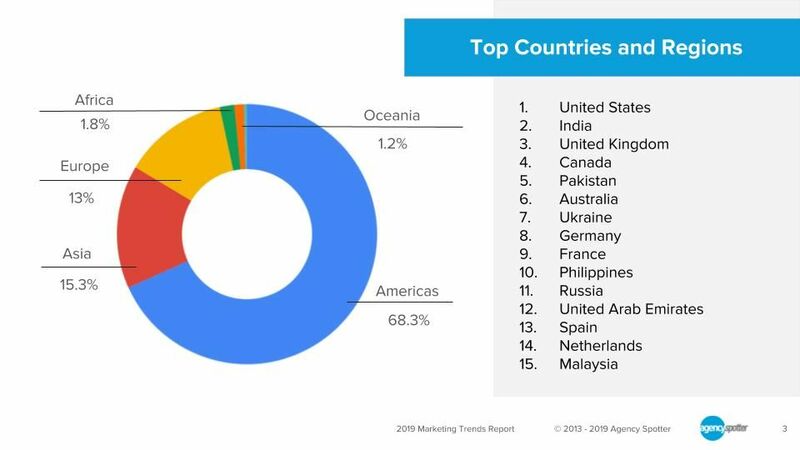 We share multi-year snapshots of how the top 25 marketing services have changed and which cities are driving the lion’s share of agency searches. No matter where you are or what service areas you focus on, we hope our data helps you and your company grow. 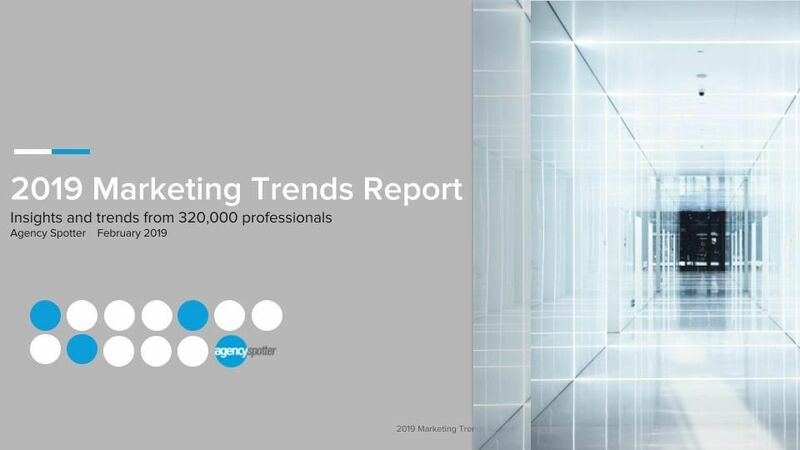 This report builds on trends over the last five years and continues to show the rise in popularity of marketing services along with the stability of others. All 41 service areas on Agency Spotter have grown in volume. Some continue to capture a much larger share of attention year over year. Throughout 2018, we helped over 320,000 marketers and subject matter experts at companies begin their agency searches. Every week some of the biggest brands are using Agency Spotter, and, for every big company, there are hundreds of small and medium size businesses looking for a new marketing agency partner. It is our goal at Agency Spotter to continually innovate to meet the demands of marketers and subject matter experts with 41 service areas. In the last twelve months, we published X Top Agency Reports covering digital agencies, advertising agencies, content marketing agencies and much more. There are 133 Brand Pages that showcase marketing agencies and design firms working for some of the largest companies on the planet whose employees use our platform, including Google, Amazon, Adidas, Microsoft, Coca-Cola, Amazon, Verizon, Dell, and Disney. We hope that 2019 is an amazing year for each of you and your companies. If you are focused on marketing alignment and transparency at a large brand, please reach out about our Agency Management Platform. Share the marketing trends with your colleagues.